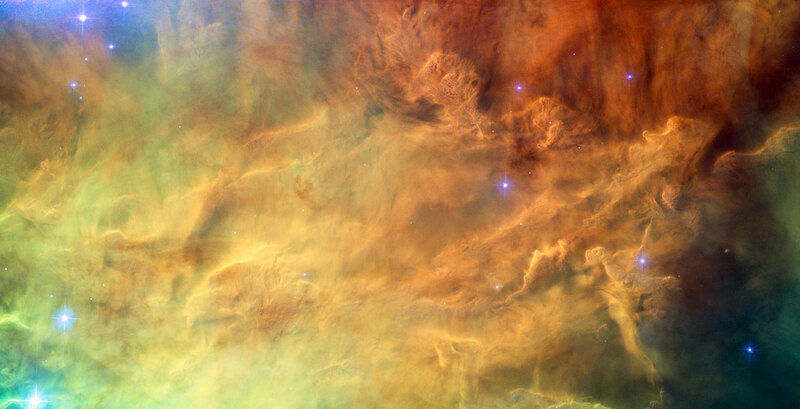 A spectacular new NASA/ESA Hubble Space Telescope image reveals the heart of the Lagoon Nebula. Seen as a massive cloud of glowing dust and gas, bombarded by the energetic radiation of new stars, this placid name hides a dramatic reality. The Advanced Camera for Surveys (ACS) on the NASA/ESA Hubble Space Telescope has captured a dramatic view of gas and dust sculpted by intense radiation from hot young stars deep in the heart of the Lagoon Nebula (Messier 8). This spectacular object is named after the wide, lagoon-shaped dust lane that crosses the glowing gas of the nebula. This structure is prominent in wide-field images, but cannot be seen in this close-up. However the strange billowing shapes and sandy texture visible in this image make the Lagoon Nebula’s watery name eerily appropriate from this viewpoint too. Located four to five thousand light-years away, in the constellation of Sagittarius (the Archer), Messier 8 is a huge region of star birth that stretches across one hundred light-years. Clouds of hydrogen gas are slowly collapsing to form new stars, whose bright ultraviolet rays then light up the surrounding gas in a distinctive shade of red. The wispy tendrils and beach-like features of the nebula are not caused by the ebb and flow of tides, but rather by ultraviolet radiation’s ability to erode and disperse the gas and dust into the distinctive shapes that we see. In recent years astronomers probing the secrets of the Lagoon Nebula have found the first unambiguous proof that star formation by accretion of matter from the gas cloud is ongoing in this region. Young stars that are still surrounded by an accretion disc occasionally shoot out long tendrils of matter from their poles. Several examples of these jets, known as Herbig-Haro objects, have been found in this nebula in the last five years, providing strong support for astronomers’ theories about star formation in such hydrogen-rich regions. Charles Messier, the 18th century French astronomer, observed the nebula and included it in his famous astronomical catalogue, from which the nebula’s alternative name comes. But his relatively small refracting telescope would only have hinted at the dramatic structures and colours now visible thanks to Hubble.